The number of unique models increased with every decade beginning in the 1920's and culminating in the 1960s. That's thanks mainly to the addition of automatic movements and Swiss-made manual winding movements, not to mention the Electrics. I think I've made a good dent in the pre-1955 models featuring made-in-Lancaster, PA movements. So I'm always a little surprised when I find a new model to add to the blog. The list of watches I haven't done is much shorter than it used to be - that's for sure. One model I've considered purchasing many times is the 1951 Grover. It's a fairly common model but it's hard to find without a lot of wear through to the tops of the horned lugs. The Grover was made through 1953 so you will also see the virtually identical Grover-B as well. The Grover came in a 10K yellow gold filled case. 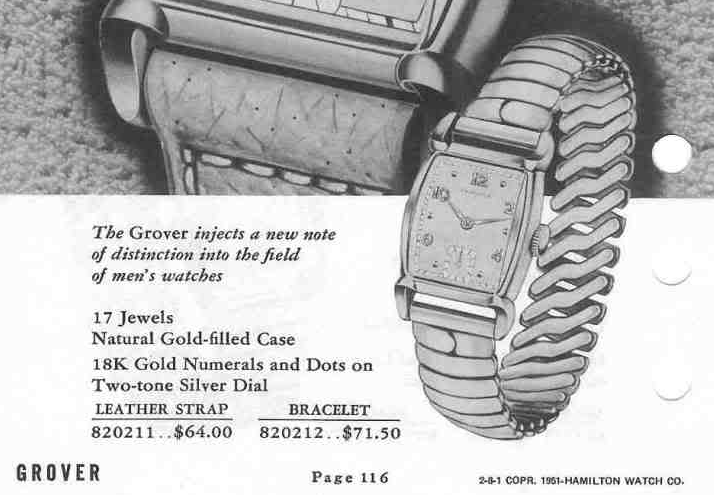 It was one of the first models to be available on either a strap or a bracelet. Because it came in a 10K gold filled case, you will find the Grover has the 14/0 size 17 jewel 980 movement. The Grover B will have the 12/0 size 17 jewel 752 movement. I recently had someone contact me about a family watch they received. Since it was a Grover and I haven't done one yet, I decided to take it on. As received you can see that this example is a mere shadow of it's former self but a little TLC will go a long way. The Spiedel bracelet is an obvious replacement. I was unable to get the spring bars loose so I had to open the bracelet ends with small pliers in order to remove the bracelet. These spring bars are not removable on lugs like these. Some models have holes that go all the way through the lugs - in which case you can push the spring bars out from the outside. But without the through-holes, the best I can do is cut the bars off. Wire snippers are all that's needed to remove the spring bars, but they can't be reused. The plastic crystal is beat up and will be replaced. Without the crystal in the way, you can see the dial has a two-tone white / butler finish and some of the white sections are dirtier than the others. It's interesting to see how the later 980's are heavily damascened like the 982 and 982M. The watch will tick but I haven't tried to wind it up and see how it works. Based on the number of watchmaker's marks inside the case back, this watch was well cared for before it was put away in a dresser drawer long ago. The watch already has white alloy mainspring installed. I'll remove it and clean it but there's no need to replace it. A new glass crystal will be a nice addition to the finished project. Uh oh, the upper pivot on the balance staff is missing. This balance is toast unless I replace the balance staff. Fortunately I had a spare balance so I installed that instead. Now the watch is running with good motion. Things look good. The beat error is a little high at 3.5ms but to reduce it would require removing the balance again and adjusting the hairspring collet. I don't have another spare balance so, lest I goof up this one, I'll just let this sleeping dog lie. The finish project turned out really well. There's a hint of wear to the top of the lugs but even my merciless camera has a hard time highlighting it. The dial is original and not bad enough to warrant refinishing. The new glass crystal made a huge improvement and a new simple black leather strap says this watch is ready for some wrist time.